Bambu Bar & Asian Bistro. Big Sky, 59716. Phone: 406-995-4933. Lotus Pad. West Fork Meadow Village, Big Sky, MT 59716. Phone: 406-995-2728. Wokkee Mountain Kitchen. Ousel Falls Road, Big Sky Town Center, Big Sky, MT 59716. Phone: 406-995-7181. Blue Moon Bakery. Located in Westfork Meadow, Big Sky, MT 59716. Phone: 406-995-2305. Chet's Bar & Grill. Moonlight Basin, Big Sky, MT 59716. Phone: 406-995-5784. Firehole Coffee. Located in the Firehole Lounge, Big Sky, MT 59716. The Lone Perk. 191 Spurr Road, Big Sky, MT 59716. Phone: 406-995-3112. Mountain Coffee Shop. Mountain Mall, Big Sky, MT 59716. Summit Coffee. Terrace level of the Summit Hotel, Big Sky, MT 59716. The Country Market. Meadow Village, Big Sky, MT 59716. Phone: 406-995-4636. Cinnamon Lodge. 37090 Gallatin Road, Galletin Gateway, Big Sky, MT 59730. Phone: 406-995-4253. Milkie's Pizza & Pub. Westfork Meadows, Big Sky, MT 59716. Phone: 406-995-2900. Trailhead Pizza. West Fork Meadows, Big Sky, MT 59716. Phone: 406-995-7175. 320 Steak House. Highway 191, Mile Marker 36, Big Sky, MT 59730. Phone: 406-995-4283; Toll-free: 1-800-243-0320; Fax: 406-995-4694. Allgoods. 3090 Pine Drive #1, Big Sky, MT 599716. Phone: 406-995-2750. Andiamo Italian Grille. Village Center at Big Sky Resort, Big Sky, MT 599716. Phone: 406-995-8041. Bugaboo Café. Highway 191, Big Sky, MT 59716. Phone: 406-995-3350. Burger Bar. Outside on the plaza, Big Sky, MT 59716. Choppers Grub & Pub. Big Sky Town Center, Big Sky, MT 59716. Phone: 406-995-3830. The Corral Bar and Steakhouse. 42895 Gallatin Road, Big Sky, MT 59716. Phone: 406-995-4249. The Gourmet Gas Station. Highway 191, Gallatin Gateway, Big Sky, MT 59730. Half Moon Saloon & Restaurant. Located on the Gallatin River, Big Sky, MT 59716. Phone: 406-995-9666. Huckleberry Café. Ousel Falls Road, Big Sky Town Center, Big Sky, MT 59716. Phone: 406-995-3130. Huntley Dining Room. Mountain Village, Big Sky, MT 59716. Phone: 406-995-5783. M.R. Hummers. Mountain Mall, Big Sky, MT 59716. Phone: 406- 995-4543. Peaks Restaurant. Summit Hotel, Big Sky, MT 59716. Phone: 406-995-8076. Pinnacle Restaurant. Top of Andesite Mountain, Big Sky, MT 59716. Phone: 406-993-5800. Timbers Restaurant & Deli. Located in the Moonlight Lodge, Big Sky, MT 59716. Phone: 406-995-7777. Whiskey Jack's. Mountain Village. Big Sky, MT 59716. Phone: 406-995-5786. Yeti Dogs. 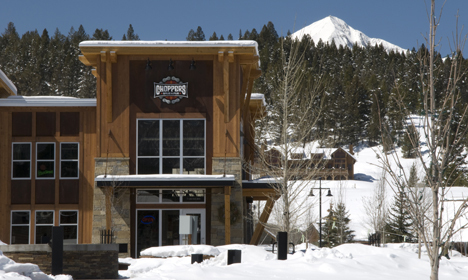 Located in the Snowcrest Lodge, Big Sky, MT 59716. Phone: 406-993-3971.